Indian Institute of Architects (IIA), Chandigarh, Punjab and Haryana Chapter organized a Seminar “Architecture at Crossroads in Haryana” at Gymkhana Club, Mansa Devi Complex, IIA has strongly opposed Haryana Government’s decision to allow construction of fourth storey on existing houses thus endangering the entire structure of old houses which were built for maximum three storeys. Seminar was attended by nearly architects from Haryana, Chandigarh and Punjab. Hyderabad based architect DT Vinod Kumar and Patna based architect Shyam Kishore Singh were the guest of honour. This program was supported by Unistone Industries and Raunaq Sales (India). 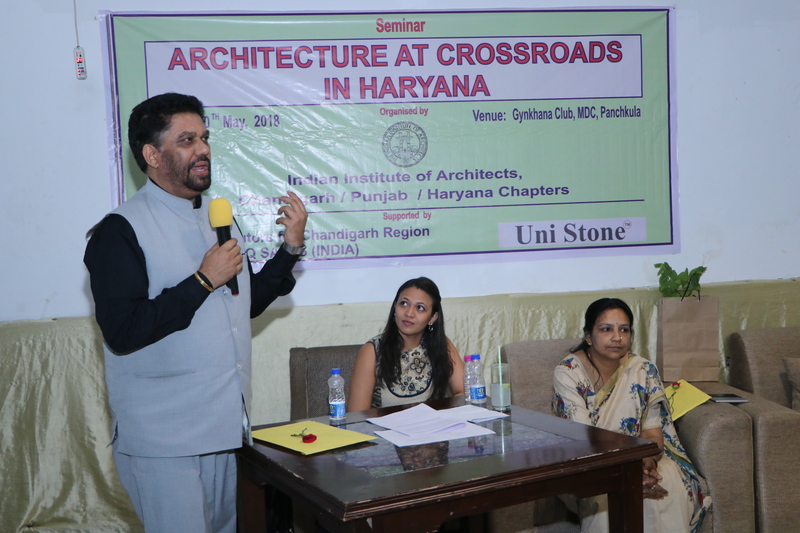 The seminar was organized to discuss various problems being faced by architects and the wrong decisions taken by Haryana Government against the public interest. Speaking on the Haryana government’s decision Architect Jyoti Choufla said, “The rules regarding increased height and free areas of stairs/lifts are being willfully abused for personal benefit at the cost of infringing upon the rights and safety of existing owners”. There was a drastic change in the Haryana Building Code 2016 rules in which Floor Area Ratio (FAR) was increased to 198 percent i.e. 66 percent on each floor. Stilt floor parking was allowed and total height was increased to 15 meters. However, a crucial change was quietly made in Haryana Building Code 2017 as per which ground plus third floor and stilt plus fourth floor while maximum height is fixed at 15 meters, with or without stilt parking in old and new houses. This is life-threatening especially in the existing/ adjoining houses as the foundations are built to support only up to 2.5 to 3 floors and adding another floor will lead to collapse of the structure. IIA said no practicing architects or civil engineers were consulted while amending these rules. Architect Surinder Bahga said, “The architects body pointed out the difficulties being faced in online approval of plans, and software Auto DCR is a failure. It is not compatible with softwares being used by different architects. It is not easy to operate and requires manual intervention. Architects wanted online approval system should be stopped till proper software is available and self-certification is restored”. Architect DT Vinod Kumar who was Guest of Honour in the seminar said, “Latest rules say that the staircase area is counted only on the ground floor and treated as free area on upper floors which is unheard of throughout India. Perhaps it was done for the benefit of builders who make multi-storeyed flats so that they could use this additional area to make more flats by misusing this stairs-area/lift-area. But imposing this same rule on individual houses will wreak unnecessary havoc on society”. Chairman of IIA Haryana Chapter, Architect Punit Sethi said, “IIA had written to Chief Administrator HUDA asking to review cumbersome procedure of registration of Architects with Haryana Urban Development Authority. Architects feel that as per Architects Act 1972, Council of Architecture (COA) already clarified that developmental authorities should not ask architects to register with them to those who are already registered with COA”. Saurabh Singla, Panchkula based Architect said, “These changes are being exploited by builders and property dealers, who are buying roofs of first floor to construct second floor, which is 20 percent of plot price, with the intention of building two floors thereby defrauding ground floor and first floor owners by infringing upon their right of increasing FAR. to 66 percent on their respective floors and endangering their lives as well as their neighbours’ lives”.